Like in issue #1, this book starts with a dose of Kid Flash. Bart is locked up in a cell lamenting his less than heroic debut (from last issue). Bart communicates through the wall with another locked up young metahuman named Danny. (Just who Danny is isn't for us to know yet, which is effective since Bart doesn't know who Danny is either). In West Hollywood, on the night before Halloween, Tim Drake and Cassie Sandsmark are grinding their gears trying to figure out why N.O.W.H.E.R.E. hasn't tried a second move on Cassie (she did, after all, make morsels out of a high-tech N.O.W.H.E.R.E copter just an hour before). Tim points out that his own detective work led him to Cassie and finds it curious that an organization as plugged in as N.O.W.H.E.R.E. couldn't do the same. Cassie's inquiry of "You think there's a clue there?" gets Tim's poignant reply, "There's a clue everywhere." If Tim's able to put the clues together, he'll follow the trail straight to the answer: Superboy. Superboy sits in front of a series of screens at a N.O.W.H.E.R.E. lab, studying footage of Sandsmark as Wonder Girl laying waste to that aforementioned copter. It would seem that the whole attack on Sandsmark was little more than a gauge of her capabilities. Superboy has been instructed to study the footage and is under orders to bring Wonder Girl in, dead or alive. Tim begins following a witness report of an apparent monster giving a group of teenagers the willies. Suspicious, Tim meets Claudia, the reporting witness. Through some detective skill, Tim knows that Claudia wasn't telling the whole story about the monster. It turns out that the monster, dubbed Skitter, is Claudia's twin sister. Tim comforts Claudia, however, she has already spoken with some "people from the government" - that is, N.O.W.H.E.R.E. - about the whole issue. Tim is in a race now to find Skitter before N.O.W.H.E.R.E. does, and inexplicably winds up in a sewer. Unfortunately, a hired goon/goons is/are already on the trail. The goon/goons is/are metahuman brothers capable of using each other's bodies for teleportation. Their collective use of singular and plural nominatives is interesting at first, but wears thin pretty fast. Eventually, Skitter gets hold of the brothers, gives them a throttling, and turns her attention to Tim. Being the good guy that he is, Tim tries to reason with Skitter, who is little more than a mindless werebug. Cassie swoops in to Tim's rescue and clocks Skitter a swift one to the jaw. Cassie leaves Tim with the KOed Skitter, saying, though untruthfully, that she wants nothing to do with him or his pursuit to save teenaged metahumans. The issue concludes with Kid Flash breaking out of his cell due to the folly of two security guards. As Bart escapes we discover that Danny is no longer in his cell. Through more numbing exposition Bart peeks into a cell through which a bright light is bursting. Inside is Solstice, a future Teen Titan. Story - 3: I've realized something important while reading this issue: I'm no longer a teenager. There's a bit of "like, ya know" parlance here, and while I think it makes sense from a character point of view, I find it a little hard to swallow. A lot of the fun is still present in this issue, but there's a jungle of bad dialogue we have to mow through to appreciate it. We're treated to a vulnerable would-be do-gooder in Kid Flash, whose speedster powers are of little help to him, given the situation. This would appear to highlight something important: Bart either (a) hasn't discovered that he can vibrate through solid matter, like Barry Allen, or (b) he doesn't have that ability at all. There's an opportunity here for Lobdell to work with this inexperience/limitation, but it's squandered at issue's end. As for Superboy's involvement... We're having our appetites whetted. Superboy vs Wonder Girl is certainly a throw down to anticipate: two of the most powerful teenagers in the DCnU scrapping it out. Unfortunately, there is only one page that features Superboy in the entire issue. Worse still is reading for the fourth time in as many comics Red telling Templar that Superboy isn't ready. If you're following Lobdell's Superboy title you'll know what I mean. It's getting stale. Tim comforting Claudia while displaying more of the compassionate leadership qualities that make him such a likable character, is an imperative trait for him, and something Lobdell needs to keep in the forefront. Tim's battle in the sewer is where the issue starts to teeter, mostly due to the garbled dialogue. The action is fine enough, thanks to Booth's pencils, but much of what we have to read is clumsy exposition. Some of these panels are examples of why action scenes should often be without dialogue, or directed by narration only. Although there's plenty of room here to explore the dichotomy between Tim and Cassie, so let's hope it isn't wasted. The final part is a ridiculous scene that would have served better if Bart figured his own way out. Art - 4: I still really like Booth's art. Those tiny details of rips and stains on clothing provide a real-world sensibility to all the characters, including those in the background. He's great at drawing action and although many of his main characters can take on similar features, he has a genuine talent for drawing emotion. Booth is working with a good artistic team with Norm Rapmund's inks and Andrew Dalhouse's colors. 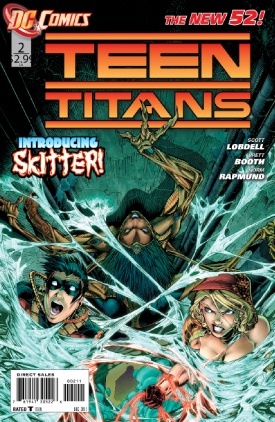 Cover Art - 3: There's one massive mistake this cover made: showing us Skitter. There's no doubt that Skitter looks good, but the reveal should have happened in the story itself. The effect is wasted on the cover.